The old Tompkins County Public Library building. 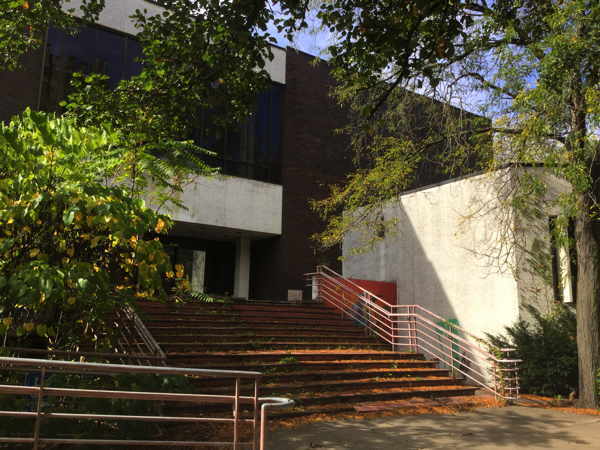 The old Tompkins County Public Library building on the corner of Court and Cayuga Streets is slated for demolition, but structural concerns and the need for asbestos removal have complicated the process. The City of Ithaca is hosting a public meeting on Thursday so community members can get an update from City staff and the development team. Two primary concerns over demolition of the old building are that it contains asbestos, which needs to be removed safely, and that it is structurally unsound, which means traditional asbestos abatement approaches, requiring workers to enter the structure, would be unsafe. City officials condemned the building after a licensed public engineer certified that it was “unsafe for occupancy during any proposed abatement activity,” according to a statement from Travis Hyde Properties. Under normal circumstances, the asbestos would be removed first, and then the rest of the building materials demolished in a way that would often leave some materials available for reuse or recycling. The public meeting is scheduled for 5pm on Thursday, November 8th in Common Council chambers on the 3rd floor of City Hall at 108 East Green Street.